Fill and Flex Primer is a fast-drying, sandable primer for all types of flexible, rigid and metal parts. It dries to sand in 5-10 minutes and featheredges better than most aerosol primers. 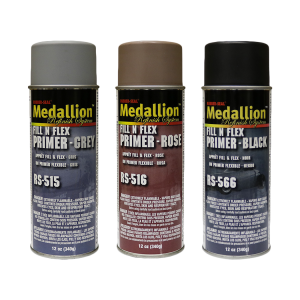 Fill and Flex Primers are available in black, grey and rose and can be purchased in bulk or in an aerosol. Packaged in 16 oz. aerosol.